This is a laboratory demonstration developed to help explain part of the theory of poroelasticity. It shows the effect of a step-load of fluid pressure upon a highly compliant and only slightly permeable poroelastic medium. The poroelastic medium in this demo consists of foam-filled balloons with small holes in them. A movie of this demo is available below in several formats. To get ready for this demonstration, I fill a bunch of balloons with pieces of foam, poke a few very small holes in them, and toss them into a large vacuum flask. I evacuate the flask to lower the pressure inside, and since there are small holes in the balloons, air leaves the balloons as well. So the low pressure system looks almost identical to the one at atmospheric pressure. At this point the demonstration is ready to go. To start the demo, I pull a cork out of the flask, allowing air to quickly enter, which brings the pressure inside the flask up by a large factor in an almost step-wise fashion. The change in fluid pressure compresses the balloons, but since the balloons are slightly permeable (due to the holes), air seeps into the pore-spaces in the foam, and brings the entire system up to atmospheric pressure over the course of about ten seconds. This also allows the balloons to return to (nearly) their original shape. The animation above and the movies below all start just before the flask is opened, and end when the system is back at equilibrium. The key to this demo are the foam filled balloons. I stuffed small (~2 cm per side) cubes of very compressible open-cell foam into 9 and 11 inch balloons. I used enough foam so that the balloons were full without being stretched. Then, I tied a knot in the balloon opening. Next, I heated a disection probe with a Bunsen burner, and used the heated probe to melt a small (1 mm) hole in the side of each balloon. Next, I poked a few more holes in the balloon with a needle. These holes allow air out during the evacuation phase, but are not very good at letting air back in, so they do not appreciably increase the permeability of the balloons for the experiment. A picture of two of these balloons is shown here. 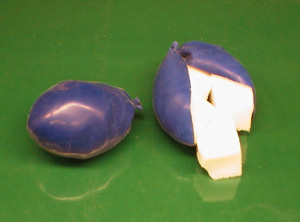 One balloon has been cut open to show the foam inside. The theory of poroelasticity describes the response of a fluid-filled porous medium to changes in stress, strain, fluid content and pore-pressure. When the fluid pressure on the outside of a fluid-filled porous medium increases, the pore-pressure within the medium increases via two separate processes: one that is instantaneous and one that is diffusive. When the fluid pressure increases (in our demo this is step-wise from a pressure of P0 to P1) the pore-pressure within the foam-filled balloons increases instantaneously as the increased stress is distributed between the pore-fluid and the frame of the porous matrix. This process brings the pore pressure up to some fraction of P1. Subsequently, in a time-dependent diffusive process, fluid flows into the porous medium, bringing the pore-pressure up to P1, and allowing the balloons to regain their original shape. Complicating the problem in this case are non-linearities arising because the balloon properties are not constant during the demonstration. Because the strains are large, the compressibility of the medium decreases as the balloons become compressed. In linear poroelasticity, the strains are small enough that the elastic properties of the system are constant, which substanially simplifies the theory. For poroelastic problems involving tidal loading on the seafloor, it is sufficient to use linear poroelasticity theory. Finally it should be noted that great care was taken in the development of the poroelastic media in order to make this demonstration work. The media had to be compliant enough so that the fluid load visibly compressed the material. Also, the media had to have a low enough permeability so that the diffusive component of the pore-pressure change would would not bring the system to equilibrium too quickly. In other words, it was required that the instantaneous and the diffusive components of pore-pressure change occurred separately in time. If the balloons had many more holes in them, or if only open-cell foam was used, we would observe very little change when the pressure was increased, because fluid diffusion would prevent the balloons from becoming initially compressed. This would make for a pretty boring demonstration! Last Updated: 08 March 2009.